Adding a Site Map to your website is essential if you want to maximize your Google Search Engine rankings. Site maps are a way to inform search engines about existing and new pages on your web site. A Site map is a special kind of file called an XML file that lists links for every page on your website along with additional metadata about each link (when it was last updated, how often it usually changes, and how important it is, relative to other links on your site) so that search engines can more intelligently crawl and rank each page on your website. Click Download to download the latest version of OSMap. Then click OSMap Free. Enter your email address and a link to the download of OSMap will be sent to your email address. Click on the link and the component will be automatically downloaded. Transfer this file to your website Extensions folder. Next go to Extensions, Manager and upload OS Map to your website. Then installation page says that we need to go to to the Plugins page to enable the plugins. But all of the default plugins are enabled. Be aware that there are many more free plug ins for the site map. But they need to be downloaded and installed separately. Next, go to Components, OSMap. OSMap comes with a default site map. We could create a new Site Map by clicking on New. But it is easier to simply edit the existing default site map. Click on it to open it and edit it. Change the name of the site map from Default Sitemap to Site Map for (the name of your website). Uncheck any menus that you do not want indexed by Google. This page will allow you to display more than one menu. If you have administrative menus that you do not want to display, simply leave them unchecked. While we could change either the priority of the frequency of the crawling, this is a good compromise and also should be left alone. Then click Save and Close. To view our site map, we need to create a menu item for it. Go to Menus > Main Menu > Add New Menu Item. Then click on Menu Item Type. Then select OSMap > HTML site map for the Menu item type. For Choose a Site Map, click on Change and select the default site map. For Menu item title, type in Site Map. Then click on the Site Map Settings tab. By default, the Style is set for No. Leave it set to no. Change Show Menu Titles from Yes to No. Click Save and Close and View Site. Everything seems OK. But as we will see in a moment, it is not OK. We could also create an XML site map. But this did not display any links. What we need to do is go back to Components, OS Map Free. Then click on Edit Links. Scroll down the page to see that we have several duplicate links. There are duplicate menu items for every article. This is because our articles are listed both as separate menu items and inside of the category blog for each chapter category. Search engines do not link duplicate links. To hide duplicate links, we have two options. First, we can unpublish links from our site map by hovering over the green check marks and clicking unpublish. This will place a red X next to this link. It does not take long to unpublish all duplicate links. This function also works well for any other links that you do not want indexed by Google. Just scroll down the page and hide any links you want. Then click Save and Close. If there is an item that is not on the list, but you want on the list, such as a component or a module, you should create a menu item for it. You can then add it to the list. Next from the OS Map Sitemaps screen, click on XML to see the XML site map. There are now no duplicate links on this map. Copy this URL and save it as this is the URL of the XML site map that we want to submit to Google. The XML Site Map is just a series of all the site links we want submitted to Google plus the date they were last updated. There are also options for a News Site Map and an images site map. But these are not really needed for Search Engine rankings and we will not include these. We are now ready to submit our site map to Google. 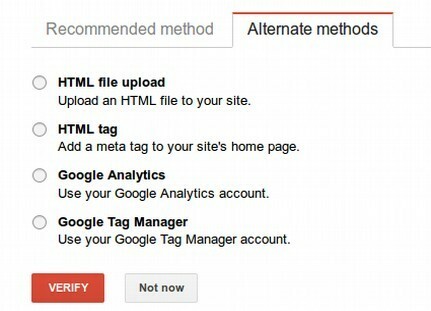 Submit in Google Web Master Dashboard. Submit a Sitemap using Google Webmaster Tools. Google uses your Site map to learn about the structure of your site and to increase their coverage of your web pages. Click on Web master Tools. If you have a Gmail account, your will be taken to your web master tools page. Copy and paste in the URL of the Home page of your website. Then click Add Property. This takes us to the Site Verification page. There are several ways to verify ownership of your site. There are several ways to verify that you own your site. Most of these are pretty invasive and involve going to your Cpanel account to add special records to your website. Click on Alternate methods. The least invasive method is to add an HTML meta tag to your website home page. This in the past was difficult to do with Joomla. Thankfully, there is a new free Joomla tool called Webmaster Site Verification that may help us with this task and eliminate the need to add records to our Cpanel account. Click on HTML tag. This will reveal a special code. This is your website verification ID number. It is a very long and complex number. Copy and paste this code to a document to help us remember it. Next, go to the Joomla Extension Directory and download Webmaster Site Verification. Here is a direct link to this free tool. Then transfer this file to your website Extensions folder and install using Extensions, Manage, Install. Then go to Extensions, Plugins and click on the extension to open it. Copy and paste the ID number into the Google ID box. Then enable the plugin. Then click Save and Close. Next, go back to the Google Search Console. Scroll down the page and click the Red VERIFY button. This is way easier than adding records to our cpanel account. Click Continue to return to our Web Master Tools Dashboard. Then scroll down the page and click on the arrow to the right of Site Maps for this website. Click on Messages to read the message from Google. If you have more than one version of your website, you can click Add a Site. Since we only have one version, we will click Submit a Site Map. Then click on Add/Test Site map. This is what we paste into the Google box. Google says that our site map appears to be an HTML page. Apparently, we submitted the wrong link. Click on Resubmit. Then click on Refresh the page. Now Google says that there are no more errors. You have submitted your Site Map and verified ownership of your website. Google will now be checking your website out on a regular basis. You can also submit a revised Site Map to Google whenever you make major changes. Wait, what about hiding the site map menu item? You do not need to display the site map to your website. To hide it, just unpublish the menu item. To see how Google currently views your site, type in your website name into the Google Search Engine. Add new content to your website as frequently as possible. Crawlers tend to ignore websites that do not change their content. Crawlers are very interested in websites that are different from the last time the crawler evaluated it. Optimize your images to improve page loading speed. Crawlers do not like websites that take a long time to load. The most common problem slowing down loading is images which have not been optimized. Pay particular attention to optimizing images on your Home page. Ideally, each image should be no more than 50 KB and certainly not more than 100KB. For the whole page, try to keep the total of all images under 1000KB (1 MB) in size. At the same time, I have heard website instructors tell students to not use more than a couple of images as it slows down page loading. This is crazy talk. Images are the main thing driving visitors to your site. So if you need to use images to make a point, then use them. Good content is more important than page loading speed. Google gives higher ranking to pages which are in the top level of your main menu. There is a lower ranking for a secondary menu item and even lower ranking for a third level menu item. So you are better off with more top level menu items in the main menu even if it means two lines on the main menu. Google does not like content which is not linked to other content. Joomla comes with a boatload of stuff which most web owners never use. So disable and or delete anything you do not need and are not using. It only takes a few seconds to disable un-needed modules and plugins with the Joomla Module Manager and Plugin Manager. Encourage visitors to refer their friends to your website. Give users a reason to visit your website – and an incentive to invite their friends to visit your website. If your website has content which readers value, they will refer your website to their friends. This is the best way to get noticed. Follow some of the site promotional tips offered throughout this book to increase your web traffic naturally. If folks are going to your site and linking to your site, the search engines will notice. Once your website initial set up has been completed, be sure to go to Cpanel. Click on Softaculous and make a back up of your website. Then download this backup to your home computer to save. This way if hackers ever bring down your site, you will quickly be able to restore it to this point. This concludes our summary of managing a Joomla website. In the next section, we will review some options for learning more about expanding your Joomla Interactive website.